When measuring the motion of distant galaxies, we use the Doppler effect to measure their speed relative to us. Basically, as a galaxy moves away from us, the light from the galaxy appears more red than it actually is. This is similar to the way the sound of a train can sound lower as it moves away from you. Of course things aren’t quite that simple because the Universe is also expanding. This means that the redshift of a galaxy is partly due to its motion relative to us, and partly due to cosmic expansion. This cosmic expansion is known as the Hubble flow. 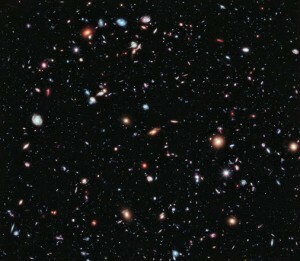 The Hubble flow is what makes more distant galaxies appear to be moving away from us more quickly than closer galaxies. For distant galaxies the Hubble flow becomes the main part of its redshift. But the gravitational interactions of galaxies can give them motions that add or subtract to the Hubble redshift. 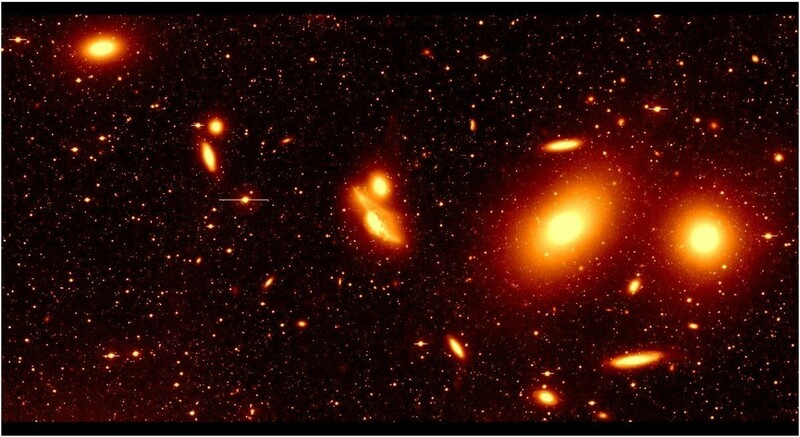 One example of this can be seen in Hubble’s original data, where the redshifts of galaxies in the Virgo cluster clearly differ from the overall Hubble relation. The cosmic microwave background shows our relative motion. Credit: WMAP. We can also measure the Hubble flow in other ways. Observations of the cosmic microwave background and gravitational lensing allow us to determine the rate of cosmic expansion as well. This means we can use the redshift to get an idea of how galaxies move relative to each other. 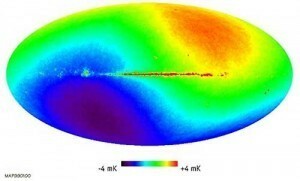 We can also use the cosmic background to determine that the Milky Way is moving about 370 km/s relative to the Hubble flow. So when we measure the redshift of other galaxies we need to take that into account. When studying cosmology, sometimes it helps to go with the flow. This is fascinating. 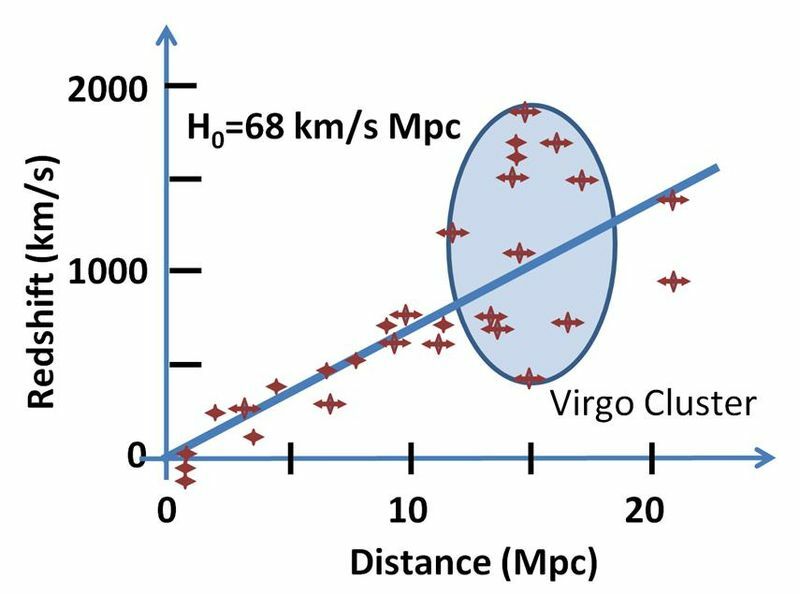 As in your plot, the Hubble constant H is approximately equal 1000 km/s/(15 mPs) = 1/ (45 x 10^16 s). From the Hubble law, v=H d, substituting d=13.8×10^9 light years (= 1.3 x 10^26 m) yields v=c. This means the curtain came up at the right time to preclude anything moving faster than c. Special relativity just survived a close encounter of the Hubble kind. L. Susskind, the chairman of the physics department of Stanford, said it is a “common misconception that objects can’t travel faster than c”, but circumstances under which c can be exceeded are presumably unrealizable. This implies objects whose light emitted near the dawn of time is now intercepted here were retrograding at velocity close to c, relative to us. Furthermore, numerous celestial bodies inferred to be at distances greater than 13 x 10^9 light years are “all over” the celestial sphere. Unless Susskind is right, this entails the “big bang” being a global — not a local — singularity. I don’t know whether the CMB radiation is consistent with globality. This is consistent with space expanding dramatically at t=0. What we don’t know about the origins of the universe dwarfs what is known. everytime i read about (an) expanding universes, i’m also wondering, if the speed determines space-time. Once, a big scientist now disappeared (http://en.wikipedia.org/wiki/Stefan_Marinov) , find a similar value = 362±40 km/sec (http://www.ptep-online.com/index_files/complete/PiP-2007-01.pdf) how absolute velocity for the Earth, but Earth is linked our Sun, and Sun is linked Milky Way. Local group of galaxies including our milkyway, I am suggesting their in orbits like our stars in our milkyway galaxy. Around a black hole some interact by gravity, attraction. Every solar mass spinning in a orbit around the black hole. Our local group of 54 galaxies are doing the same,since their 65 million light years away in about 5 million years or more we can determined their orbit because of distance and light speed is slow at that distance. And other local groups of galaxies are doing the same, all are interconnected so red shift is only appears their moving away when in fact their all in orbits in a circle in a billion years we might see other local groups of galaxies come back. @Clifton wilkinson, do not confuse red shift, consider Local group of galaxies on the surface of a sphere that is swelling, then we and the local group are moving away. Yes local group of galaxies including our milkyway orbits Around a black hole. thats not what iam inplying. their no blackhole in the center of the local groups of galaxies. their gravitational bond to each other. the milkyway ways example. as the milkyway is spinning one side is moving away. if you are in a point not moving. in time it will spin around and move back to you. Thats OK. I was inplying to the local groups of 54 galaxies and beyond. If we know how fast we moving , our milkyway galaxy. 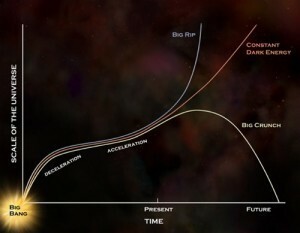 With expansion of space our milkyway galaxy should be accelerating with time.